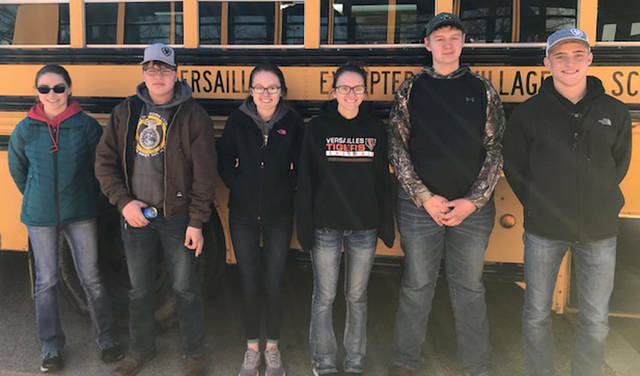 The Versailles FFA middle school first place state wildlife team included (l-r) Kristopher Marshal, Austin Spradlin, Elijah Grillot, Gabe Marchal, Hayley Smith and Kylee Hainline. 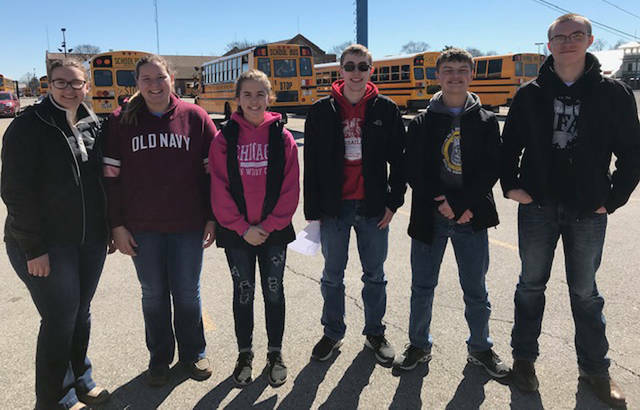 The 11th place high school agronomy team included (l-r) Madison Henry, Greg Bohman, Jessica Lyme, Deanna Hesson, Jacob Wuebker and Cole Luthman. The Versailles FFA fourth place state dairy products team included (l-r) Laura Wuebker, Anna Barlage, Elise George, Brad Dider, Dylan Meyer and Trent Langenkamp. The third place high school state general livestock team and 10th place middle school team included (back row, l-r) Xavier Grillot, Elliot George, Emma Peters, Kimberly Winner, Troy May, Luke Billenstein, Evan Rammel, Marcus Berger, Ben Albers, (front row, l-r) Kaiyla Hecht, Reagan Winner, Kayla Bohman, Luke Winner, Lewis Winner, Ian Gehret and Kobe Epperly. 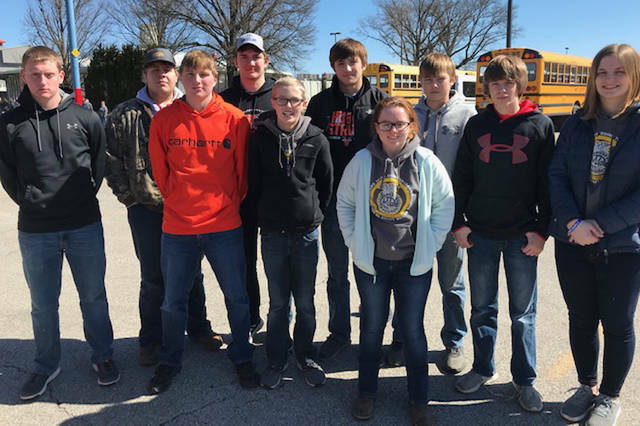 The high school third place state wildlife team included (back row, l-r) Carter Luthman, Evan Keller, Isaac Grilliot, Alex Kaiser, Caleb Kaiser, Jayden Groff, Jaimee Hoelscher, (front row, l-r) Wes Gehret, Owen Gehret and Chloe Grilliot. The high school poultry judging team included (l-r) Sara Cavin, Darian Feltz, Jon Gehret and Paige Platfoot. 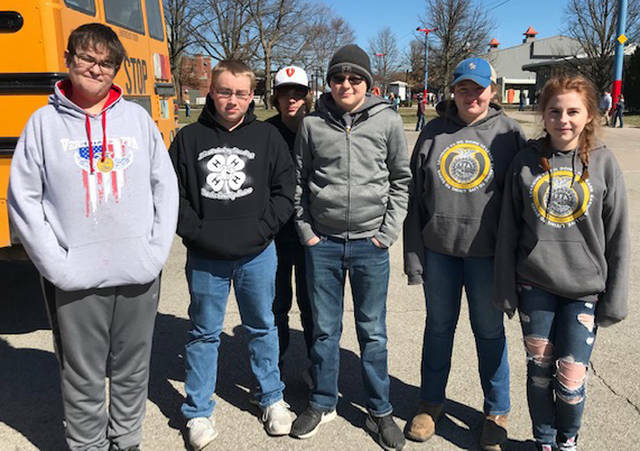 COLUMBUS – Versailles FFA competed in the State FFA Career Developments on March 23 in Columbus at the State Fairgrounds. The general livestock team placed third overall in the preliminary round. The team consisted of Emma Peters, Kobe Epperly, Troy May, Marcus Berger, Ian Gehret, Xavier Grillot, Ben Albers, Luke Billenstein, Lewis Winner, Kayla Bohman, Evan Rammel and Kimberly Winner. The team was led by Emma Peters, who placed seventh overall out of more than 900 individuals; Kobe Epperly, who placed 27th overall; Troy May, who placed 32nd overall; and Marcus Berger, who placed 34th overall. Four contestants will re-compete and will judge three classes and give three sets of oral reasons, competing at the end of April. Dylan Hesson and Ryan Sorensen helped coach the team and prepare them for the state contest. Brian Winner, Gary Phlipot, Doug Hesson and Chris Goettemoeller hosted general livestock judging practices at their farms. The poultry team placed 23rd overall in the state. The team consisted of Darian Feltz, Jon Gehret, Paige Platfoot and Sara Cavin. The team was led by Darian Feltz, who placed 90th overall. Weaver Brother’s Eggs donated eggs, and Justin Feltz assisted and coached the poultry judging practices. The wildlife team placed third overall in the state. The team consisted of Alex Kaiser, Caleb Kaiser, Evan Keller, Jayden Groff, Wes Gehret, Chloe Grillot, Isaac Grilliot, Jaimee Hoelscher, Owen Gehret and Carter Luthman. Leading the team and placing ninth overall was Alex Kaiser followed by Caleb Kaiser, who placed 20th overall, and Evan Keller, who placed 47th overall. This is the highest placing for the Versailles FFA wildlife team, and the team earned the first banner for the school year. The top four wildlife team members consisting of Alex Kaiser, Caleb Kaiser, Evan Keller and Jayden Groff qualified on April 12 to compete in State Environmental and Natural Resources Contest. John Kaiser helped coach the wildlife team. The dairy products team placed fourth overall in the state. The team consisted of Trent Langenkamp, Laura Wuebker, Anna Barlage, Dylan Meyer, Brad Didier and Elise George. The team was led by Trent Langenkamp, who placed ninth, followed by Laura Wuebker, who was 15th overall. This team earned the second banner for the school year and the first banner in this area ever for Versailles FFA. Larry Lokai helped coach the team. The agronomy team placed 11th overall. The team consisted of Madison Henry, Jacob Wuebker, Cole Luthman, Gregory Bohman, Deanna Hesson and Jessica Lyme. The team was led by Madison Henry, who placed 38th overall. Close behind her was Jacob Wuebker, who placed 43rd. Taylor Bergman helped coach the team. Fort Recovery FFA allowed Versailles FFA to join a practice. 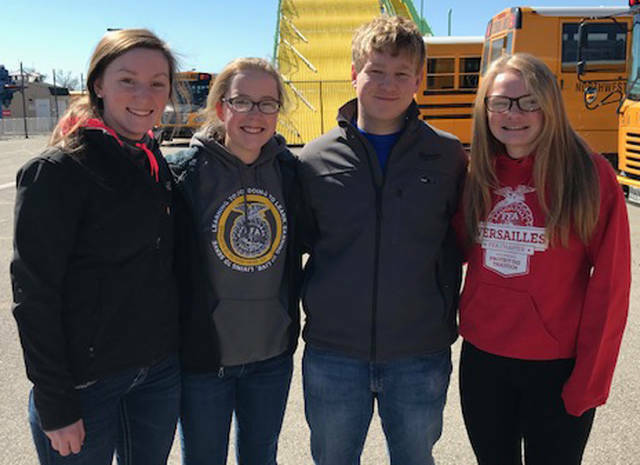 Also on March 23, Versailles FFA had several middle school judging teams compete in the state contest in Columbus at the State Fairgrounds. The wildlife team placed first overall in the state with the team consisting of Kristopher Marshal, Gabe Marchal, Austin Spardlin, Kylee Hainline, Hayley Smith and Elijah Grillot. The team was led by Kristopher Marshal, who placed first overall; Gabe Marchal who placed fourth overall; Austin Spradlin, who placed seventh overall; Kylee Hainline, who placed ninth overall; Hayley Smith, who placed 11th; and Elijah Grillot, who placed 12th overall. 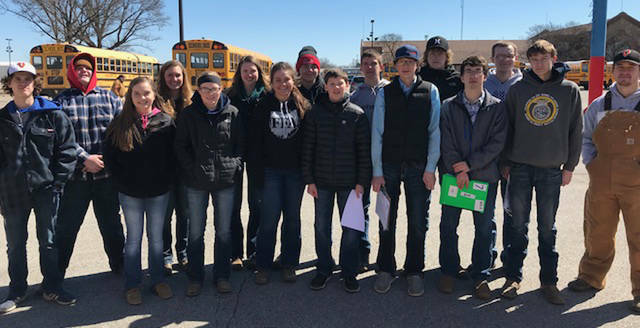 The general livestock team placed 10th overall in the state in the middle school division with the team consisting of Luke Winner, Kayla Hecht and Reagan Winner. The team was led by Luke Winner, who placed 37th; Reagan Winner, who placed 44th; and Kaiyla Hecht, who placed 67th.